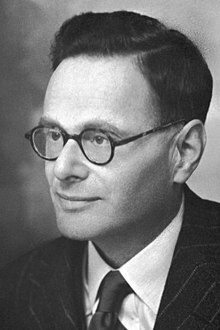 Sir Hans Krebs (Hans Adolf Krebs, 25 August 1900 – 22 November 1981) was a German Jewish scientist who became a naturalised British citizen. He was a physician and biochemist. Krebs researched metabolism. He is famous because he discovered the urea cycle and the citric acid cycle (also called the Krebs Cycle). Krebs won the Nobel Prize in Physiology or Medicine for this, in 1953. Krebs was born in Hildesheim, Germany. His mother was Alma Davidson. His father was Georg Krebs. Georg Krebs was an ear, nose, and throat doctor. Krebs studied medicine at the University of Göttingen and the University of Freiburg from 1918–1923. He earned his Ph.D. at the University of Hamburg in 1925. Next, he studied chemistry in Berlin for one year. In Berlin, he helped Otto Warburg at the Kaiser Wilhelm Institute for Biology until 1930. Krebs worked as a doctor in the Altona hospital and at the University of Freiburg. At the University of Freiburg he researched the urea cycle. Because he was Jewish, Krebs could not be a doctor in Germany. In 1933 he moved to England. He worked at Cambridge with Sir Frederick Gowland Hopkins. In Cambridge he researched biochemistry. In 1945 he became a Professor (teacher) at the University of Sheffield. In 1954 he became a professor in Oxford. After his retirement, Krebs continued work at the Radcliffe Infirmary until his death. He was a fellow of Trinity College in Oxford. In 1953 Krebs received the Nobel Prize in Physiology for his "discovery of the citric acid cycle". He was knighted in 1958. Krebs was elected Honorary Fellow of Girton College, Cambridge University in 1979. In 1938, Krebs married Margaret Cicely Fieldhouse. They had three children: two boys and a girl. His son John Krebs was an ornithologist (scientist who studies birds) and member of the House of Lords. His other son was called Paul. His daughter was Helen. Krebs died in Oxford, England in 1981. 1937 Identification of Citric acid cycle or "Krebs cycle"
↑ Stubbs M. & Gibbons G. 2000. "Hans Adolf Krebs (1900-1981)...his life and times". IUBMB Life 50 (3): 163–6. doi:10.1080/152165400300001462. PMID 11142342. ↑ Raju T.N. 1999 (May). "The Nobel chronicles. 1953: Hans Adolf Krebs (1900-81) and Fritz Albert Lipmann (1899-1986)". The Lancet 353 (9164): 1628. doi:10.1016/S0140-6736(05)75758-5. PMID 10334294. This page was last changed on 26 July 2017, at 14:41.